Schools in low-income communities can’t do much to end the challenges their students face at home. Whether it’s a lack of food security, an overworked parent or the responsibility of caring for a younger sibling, at-home struggles can make focusing in class incredibly taxing. But what schools can do, some districts are showing, is help students release the stress associated with those challenges by handing them a yoga mat. 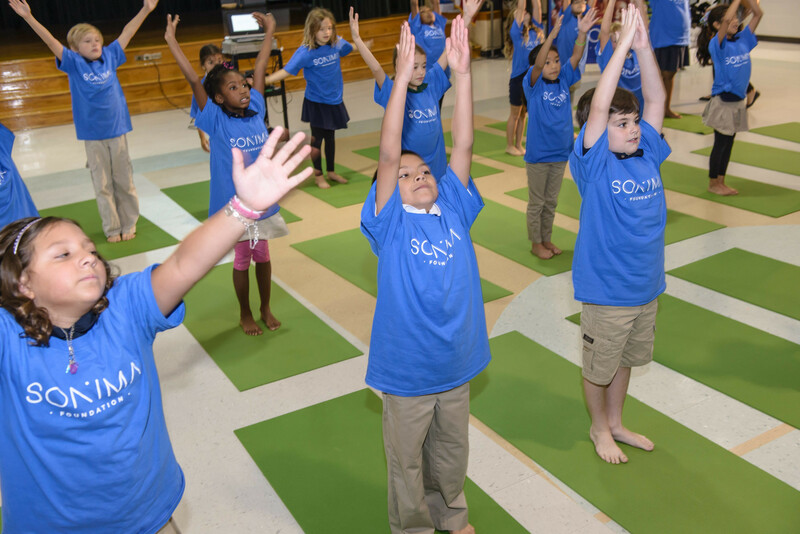 K-8 students in the Ravenswood School District in the San Francisco Bay Area are the latest to partner with the Sonima Foundation, an organization offering yoga and mindfulness training at schools across the country. The foundation is chaired by billionaire investor Paul Tudor Jones II and overseen by some of the biggest names in mind-body health, including Deepak Chopra. For the past month, 3,400 students from five schools in East Palo Alto and two in Menlo Park have been participating in twice-weekly sessions as part of their curriculum. The participating schools call famously wealthy Silicon Valley home, but they also educate some of the area’s most disadvantaged students. Ninety-eight percent of the students qualify for free or reduced-lunch programs, said Russell Case, the foundation’s program manager for the Ravenswood schools. Yoga, he says, provides the same relief for these kids as it does for the millions of others who practice it: stress relief, an improved state of mind and better physical health. “What we’re trying to do is give an opportunity to that child to release stress with some vigorous movements and then do some deep breathing to relax, calm themselves and reboot their whole system, and then come into their math class with a fresh perspective,” Case said. Through a partnership with Stanford University, which received a grant to study the effectiveness of such activities, the program is funded for at least the next three years, according to the Daily News in Menlo Park. Case says he hopes the participating schools experience an 80 percent decrease in discipline issues, slightly higher than the rates the Sonima Foundation report achieving with similar programs in parts of San Diego, New York City, Florida and Texas. Ultimately, he hopes meeting that goal will help slash Ravenswood's high school dropout rate, which he says hovers around 50 percent. 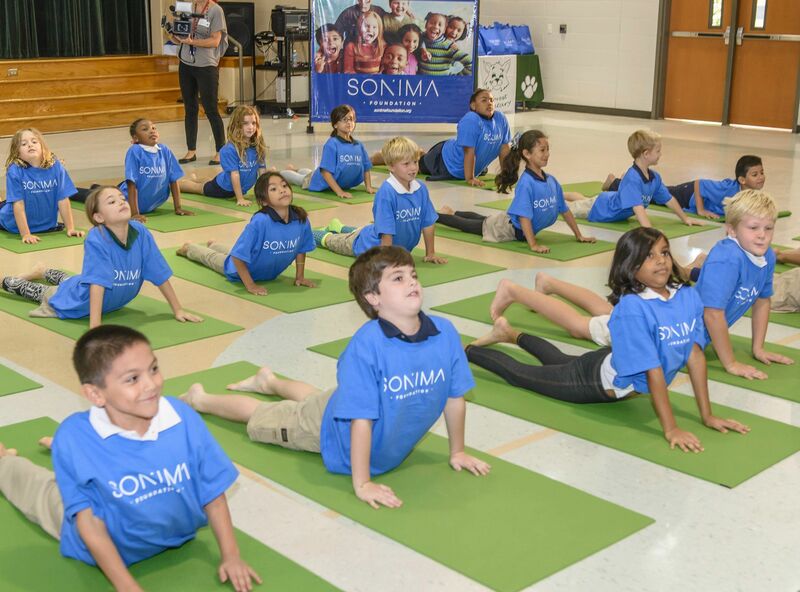 In 2012, the Sonima Foundation began implementing a yoga program in the Encinitas Union School District (EUSD) in San Diego County. A University of San Diego study of the program found that of 101 fifth-graders reporting high levels of stress -- including feelings of being left out or rejected -- before starting the program, 58 improved their ability to self-regulate and react less negatively to social stressors. The researchers note that because the study did not include a control group, they cannot directly attribute the students' improvements to their yoga participation. But EUSD officials do credit the wellness program for some improvements within their district, and cite a 37 percent decrease in the number of suspensions and a nearly 4 percent increase in attendance since implementing the wellness activities. When Ravenswood Superintendent Gloria M. Hernandez-Goff saw the success EUSD had with the Sonima Foundation, she knew she had to sign on. "I was sold right then and there," she told the Daily News. While the numbers are promising in Encinitas, it's a wealthier community where children likely face fewer stressors than those in East Palo Alto. To evaluate if Ravenswood experiences similar benefits, the participating students will be monitored by Stanford researchers. The researchers will spend the next four years completing bio-psychosocial assessments to gauge the children's emotions, behavior, cognitive ability, brain activity and stress levels. “We’re really looking forward to a year from now -- when I tell you this is effective -- for you not to only take it on my word, but for you to also have data,” Victor Carrion, a professor of psychiatry and behavioral sciences at Stanford, said in a university press release. Scientific research into the benefits of yoga has only picked up in recent years, but studies have found that the practice rewards people with lower stress levels after just one class and can "reduce anxiety and heighten brain chemicals that combat depression and anxiety-related disorders" after a few months. A 2003 study by researchers at the California State University system found that practicing yoga helped improve kids' self-esteem. After a year of doing yoga, there was a 20 percent increase in the number of students who agreed with the statement, "I like myself -- I think I'm a great person." The researchers also reported a “statistically significant” link between yoga participation and better grades. It appears parents and schools are catching on. According to a report last month based on data from the National Health Interview Survey, more American children are practicing yoga than ever before. 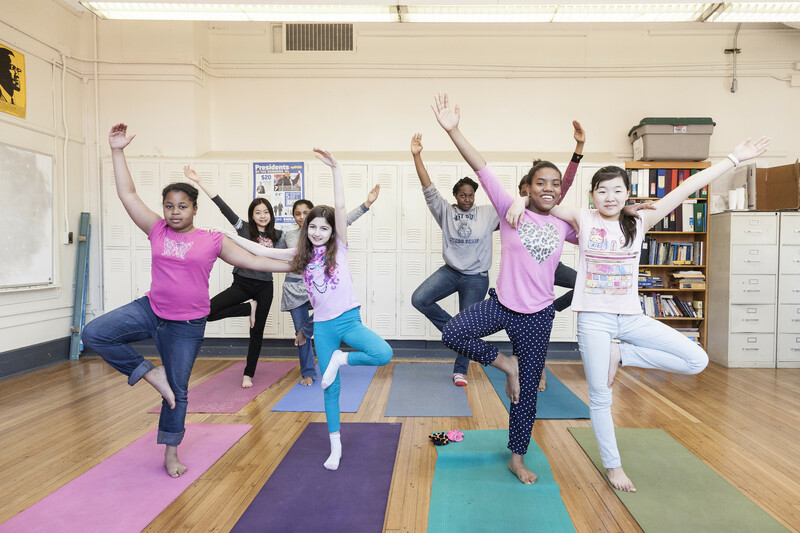 Schools partnering with local yoga studios -- such as New York public schools with Little Flower Yoga -- and schools that have created their own in-house yoga and wellness programs -- including the Toronto District School Board -- have reported successes. While the Sonima Foundation hopes their partnership with Stanford will eventually provide data that proves yoga and wellness programs should have a place in all schools, its instructors are happy with the results they see so far. The students have been enthusiastic, regardless of age and gender, instructor Ashley Bening said. Instructor Molly Smith said that one kindergartner told her, "That made my heart feel good." Holly Fennell, another yoga teacher, reported that one of her young students said, "l feel less clutter in my head after l make the yoga." Sun Salutation sequences are traditionally performed as a way to awaken the body. "This is great to do upon rising, even before you have had your first cup of coffee," Bielkus says. To perform the sequence, stand up straight in <a href="http://www.yogajournal.com/poses/492" target="_blank">Mountain Pose</a> (<em>Tadasana</em>) with the feet together and arms at the side of the body with open palms. Sweep the arms up and extend them over the head on the inhale, then exhale and bow forward into a forward bend. On the inhale, lift the torso halfway up, place your hands at your shins and extend the spine. Fold forward again on the exhale. When you inhale, sweep back up and bring the palms together into prayer. Repeat this sequence three or four times. <a href="http://www.youtube.com/watch?v=0LPLwC4pRzk" target="_blank">Click here </a>for a video tutorial.